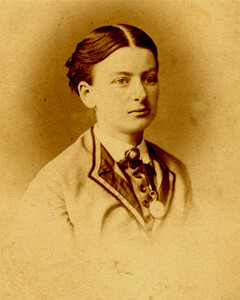 Rebecca Dana (Tracy) McCallum (1840-1919), a member of Abbot Academy’s class of 1859, inherited an interest in foreign mission work from her parents, Dr. Stephen and Alice Tracy who had spent a decade in Siam. She spent the war years in Andover with her parents, but sailed from New York in July 1868 to join her married sister in Sivas, Turkey. She was married “out of the mission” in March 1870 to Edward H. McCallum, an Englishman in the telegraph business. They returned to the United States in 1872 and settled in Lansing, Michigan.